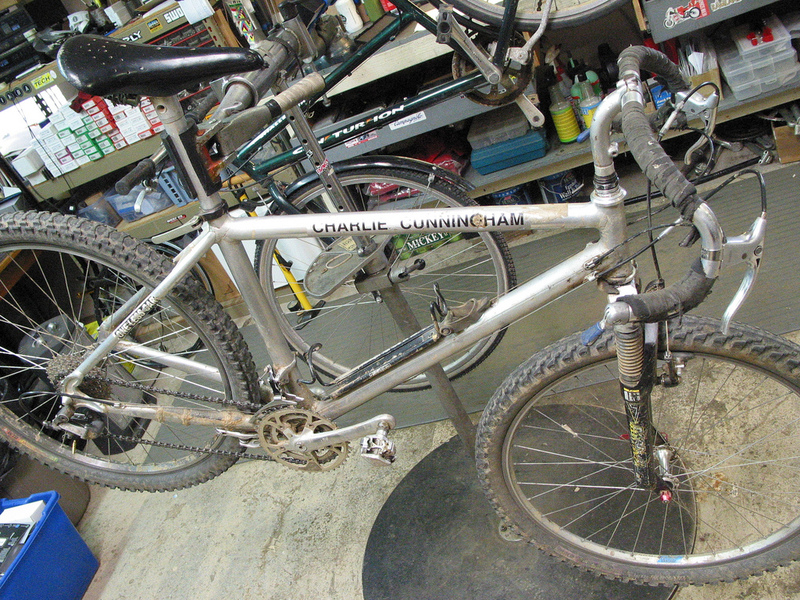 Today I took my 1992-era “Colomboham” (experimental Italian aluminum bike with suspension fork that is very very squeaky, tired) to be fixed at Black Mountain Cycles. Normally, CC takes care of my three Cunningbikes, but these days he’s been too busy with outside work. As often happens, there is an even shittier mechanic than me out there, and Chas is wrestling with his wreck, er…bike. I get a little boost knowing I’m not the only Destroyer out there…. Cunningham#36 landed on our doorstep yesterday. The owner had probably never done (or had done) any maintenance on the machine since it was bought. Everything was rusted, frozen in place. Not sure if he was the original owner, but if it were a puppy picked up from the pound, you’d say it had Serious Issues. Untreated wounds. The seapost was frozen in place (it would have to be machined out, and client doesn’t have the dough to cover the hours of work). I helped CC hold the frame level horizontally to remove, inspect and replace the press-fit bottom bracket which had its own sad past. The shop is about 49 degrees all day, I gotta hand it to CC’s hardiness…. Check out dem brakes. Client told CC that one thing he really liked was the feather-touch braking action. But when Charlie looked at (and tried) them, they, too were frozen and useless. Reality-based assessment: bike needs a proper home. Owing to fantasy-based world the owner inhabits, the bike will continue to be chained up, the heavily oxidized treasure/investment that did not float away when times got tough. Proposed bumper sticker: "I hallucinate braking action"
~ by jacquiephelan on January 26, 2011. Good grief, was he hanging it off the bottom of the Santa Cruz pier for the past 15 years? 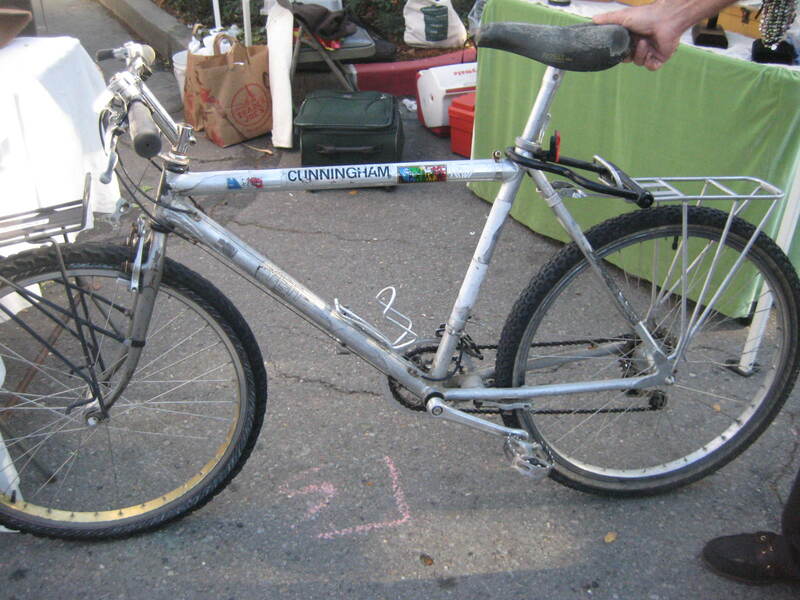 It actually looks worse than my woodshed Schwinn Suburban did when I got it. What a shame! I offer my machine shop services if Charlie doesn’t want to deal with it. You know how to reach me. (I interviewed you a few weeks ago) See you on the (Annadale) trail…. I am so sorry for Cunningham # 36. No bike should be neglected like that, even one that lives at the coast. 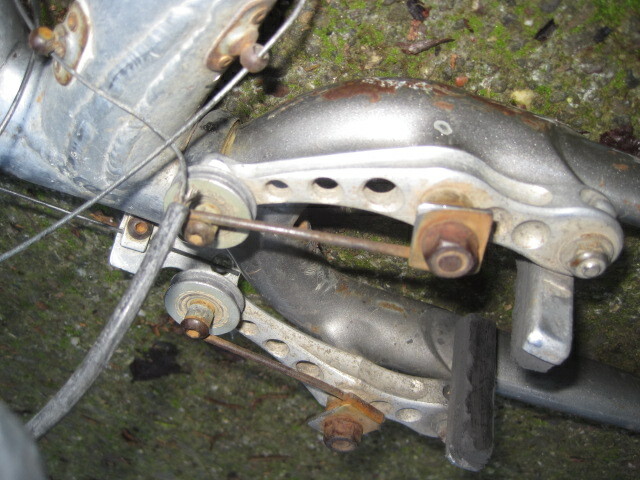 Makes me sad to look at all the pitting and rust. Wow. I’ll give that bike a good home! I remember poring over issues of Mountain Bike Action in the late 1980’s and early 90’s. Oops… I didn’t finish. I remember scrutinizing photos of Cunninghams and wishing deep in my 18 year-old heart that I had a bike like that. The closest I ever got was a Cannondale in 2001. 🙂 It DOES have a drop handlebar on it though!